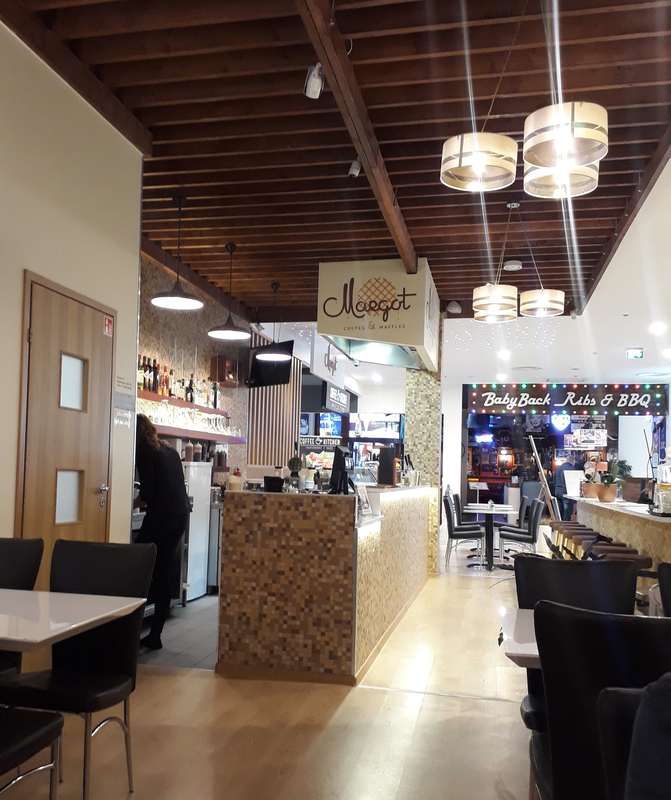 Review: Margot Crepe and Waffles actually has two locations: one in Telliskivi and one in the Nautica Keskus. For this trip we went to the one in the Nautica Keskus which is a great newly renovated mall next to Terminal D – the place where you can catch the Ferry to Helsinki (and other places). Getting to ferry is actually a little more challanging than you would think but you can take the number 2 or number 20 bus right to the Reisisadam D-terminal stop OR you can take any bus or tram to goes to the Hobujaama stop and walk 5 minutes to the keskus. Once inside, go up to the second floor and right past the mini golf you’ll find Margot. There is a small amount of seating inside but there were almost no people when we went as I doubt many people make it past the other two cafes in the building and the several restaurants to this shop. There is cute counter seating and also some small tables with a little bit of privacy but the space is largely without too much personality. There are savory and sweet crepes, as well as waffles. All waffles come in half or full size (who eats half a waffle though!) and there’s an assortment of flavors and the option to customize if you don’t find anything on the menu that appeals to you. 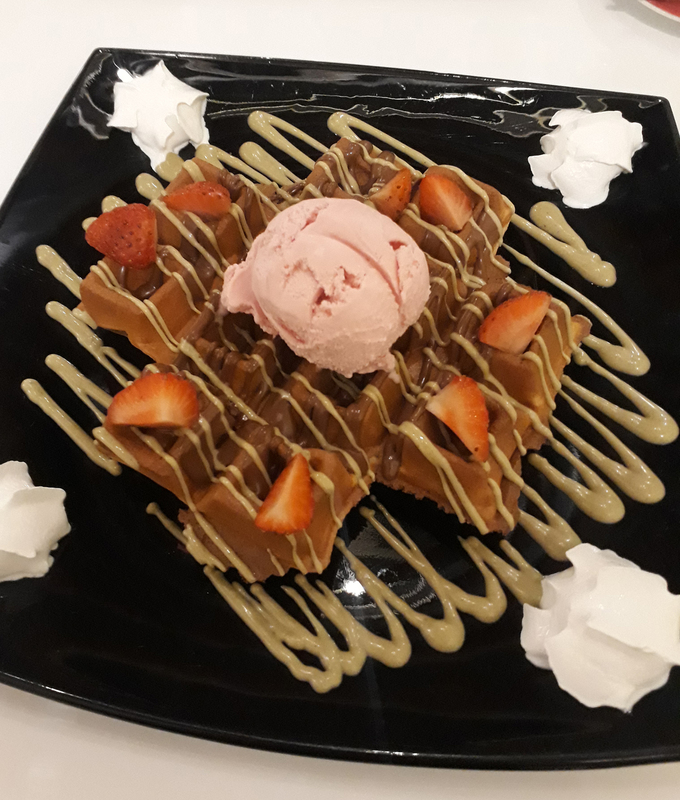 I had the Margot Waffle which is a waffle with Nutella, pistachio cream, strawberries, and strawberry ice cream. The plate came dotted with whipped cream as well. This was a pretty sweet affair, probably about as sweet as it looks. The pistachio cream seemed to be a mix of blended nuts and white chocolate giving it a slightly odd flavor. 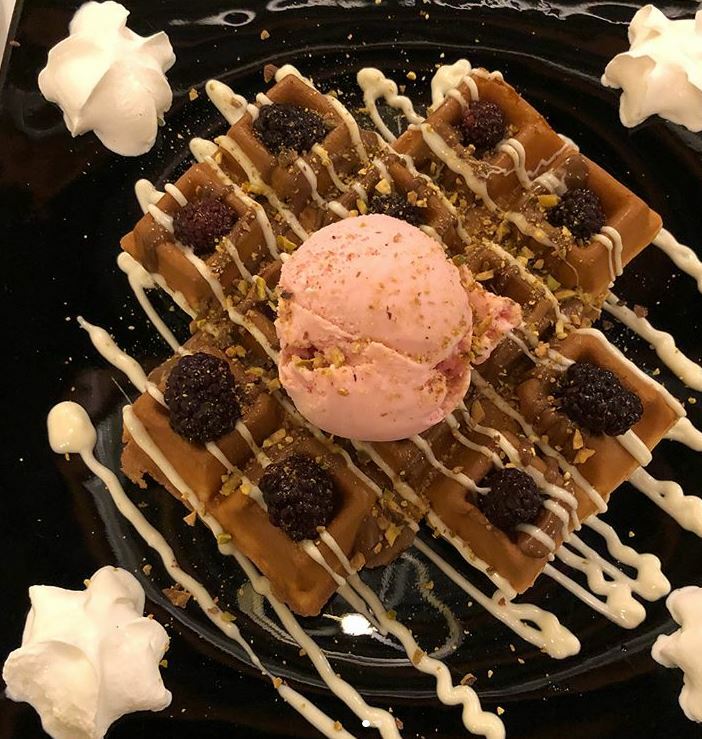 The best part of the waffle was the strawberry ice cream on top slowly melting into the crisp waffle. It might be difficult to see from the picture but there was also a drizzle of milk chocolate which was all just too much for me. Greta got the Black Forest Waffle which has White chocolate, roasted pistachios, blackberries, and strawberry ice cream. This one had crushed pistachios instead of the heavier pistachio cream but still suffered from the same problem as my waffle. Actually both these waffles would do well with some classic Coco Chanel advice: “Before you leave the house, look in the mirror and take at least one thing off.” We both enjoyed the waffles and had no trouble eating them but I don’t think either of us ate dinner after these sugar bombs and next time I’d probably just get a plain waffle with either ice cream OR some chocolate cream on top. These concoctions are just a little too overindulgent. The coffee at this place was completely average here. Nothing too exciting to report. 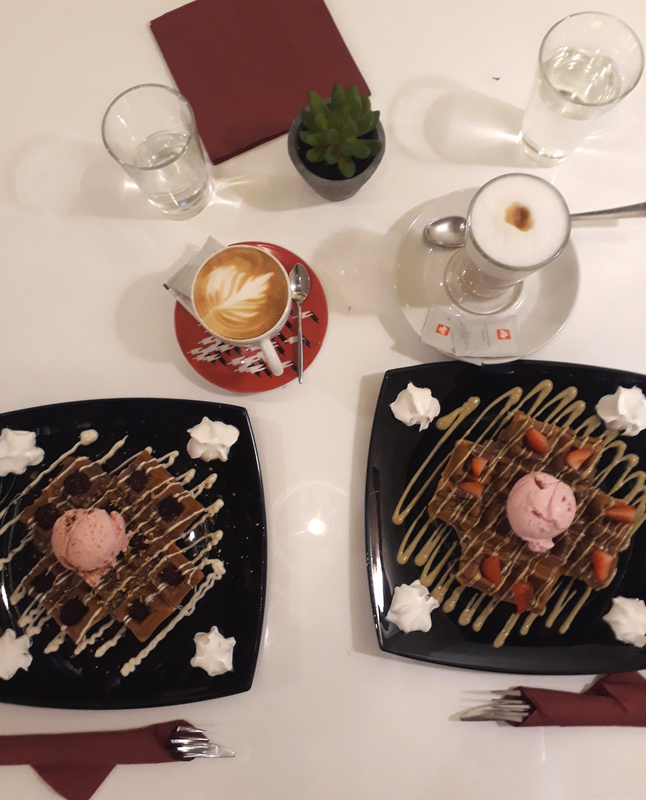 The service was very nice though it took longer than average because the waffles were absolutely lovingly made to order which was fine because we were the only people there when we ordered but it was a long enough wait that if anyone else were here I might skip this place. The waffles were good but not as good as the ones at Mrs Waffle in the Ülemiste keskus. That being said this was a good experience and I’d be open to coming back and trying their crepes to see if they have more a “wow” factor. And of course, maybe playing some mini golf next door!